There are a lot of things to think about when arranging wedding cars. Having confidence in your supplier is paramount in giving you peace of mind on the day itself, as well as the build-up. Not only this, but you need to ensure that your booking will complement the style and theme of your wedding. BookAclassic has plenty of years’ experience organising wedding cars which proudly resulted in a silver certificate of excellence from the prestigious Bridebook awards. The dedicated customer service team will be on hand throughout the process to ensure that everything goes smoothly and you can relax and enjoy the day. 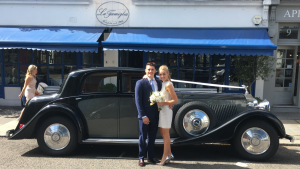 With that in mind, our wedding car hire experts have answered some of the most common questions wedding couples have so you’ll have no problems finding your ideal wedding carriage. This will vary quite significantly dependant on what model and time you would like the vehicle for. Some fun options such as the VW Beetle start from around £150 whereas more luxury options such as the Rolls-Royce Phantom will be triple that. With the largest selection of wedding cars in the UK, you can be sure that you will find something that fits your budget perfectly. I am on a tight budget and have a large wedding party, what should I do? This should not be a problem at all. We have loads of fantastic options that you can fit multiple people in so you don’t have to hire umpteen vehicles. How about the whole bridal party travelling in a VW Camper? Effortlessly cool and fits the bohemian aesthetic. Another option would be to hire a classic Double Decker and fit the entire guestlist in. It is usually traditional for the bridesmaids and mother of the bride to travel together. The bride and father of the bride would travel in a separate car. The groom would then travel to the ceremony with the groom party. However, it’s 2019 so rules are there to be broken, do what you will feel most comfortable with. 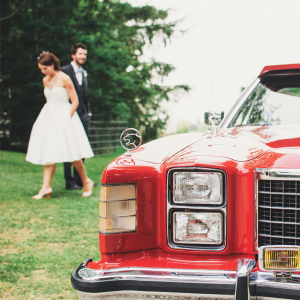 In general, most of our wedding orientated vehicles will have a Chauffeur. Once booked you are able to liaise with the Chauffeur and ensure that his outfit will fit in with the style of your wedding. Alternatively, you can take a look at our self-drive offering and if you find something that you love you are more than welcome to cruise in yourself. When does each car need to arrive at the venue? Assuming that you are hiring a car for the grooms', bridesmaids and bride there are some timescales that should be adhered to. The grooms' party should arrive at least 45 minutes before the ceremony allowing them to guide guests to their respective seats. The bridesmaids and mother of the bride should come in a bit later but with at least 15 minutes to spare. Finally, it is time for the grand entrance of the bride and father of the bride. Make sure the car is due to arrive 5 minutes before the start of the service. If you wish to have a photographer then allow 5 extra minutes for each to ensure that you get THE shot.